“As I get older my memory grows worse, but if I’m not mistaken Beetle Queen Conquers Tokyo is the first documentary feature ever to be reviewed here at Wtf-Film. For you outsiders, a documentary is just like a regular film, only it’s about real stuff. I know, I know. What will the kids think of next? All joking aside, the sudden realization that I’ve never, in nearly a decade of writing about film, covered a documentary was quite surprising. I watch a lot of them, after all – generally at least two a week. It’s not enough to keep pace with the dozen or so feature films I gorge myself with on a weekly basis, but more than enough to warrant pondering how I’ve never happened to write about one before. 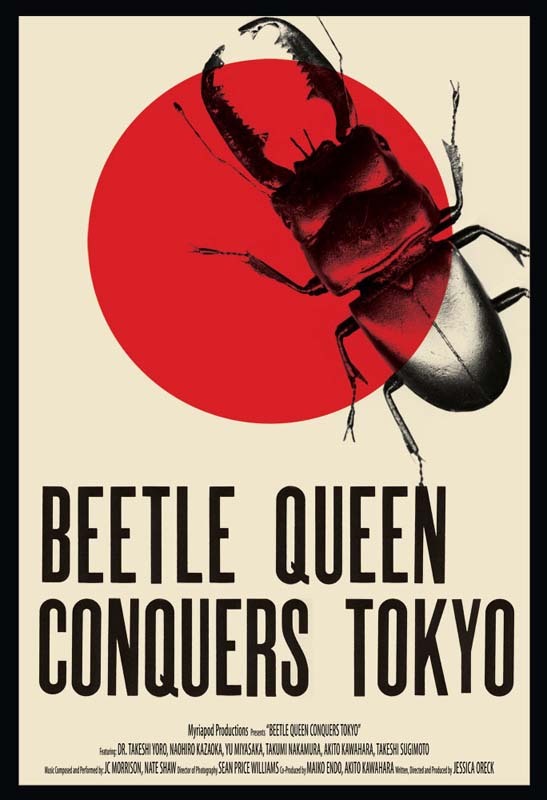 Better late than never, I suppose, and Jessica Oreck’s Beetle Queen Conquers Tokyo is as fine a place to start as I can think of. Though its title suggests giant monster mayhem, another of Japan’s peculiar preoccupations, Beetle Queen Conquers Tokyo is instead concerned with the Japanese’ fascination with of some of the smallest of things. The title is an introduction to the role insects have had and continue to play in the country’s cultural development, and directly references a rare beetle that recently fetched a whopping $90,000 from a Tokyo buyer. That said, Beetle is not really about insects at all, and shouldn’t be confused with the nature documentaries most of you are no doubt familiar with. Beetle is an observation on the natural philosophy of a civilization, at once an explanation and an example of the concept of mono no aware. Without delving too deeply into it, mono no aware is an awareness of the transience of existence, a concept by which the impermanence of beauty is integral to its appreciation. In practice mono no aware allows for finding beauty not only in rare moments, like the seasonal blooming of cherry blossoms, but in the fleeting moments of everyday life. In Beetle Queen Conquers Tokyo writer and director Jessica Oreck frequently takes time for the appreciation of the seemingly mundane – like businessmen reading on a subway train, or the balletic movements of umbrellas in the summer rain. She observes the Japanese with the same honest fascination that they show for their insects, and begrudges any linear narrative convention in favor of something more transcendental. Beetle Queen Conquers Tokyo has no singular protagonist, makes no assumptions and draws no conclusions. The camera follows a variety of individuals, from a child hunting for a new pet in a beetle shop and a man who earned enough selling beetles to buy a Ferrari to the elder Dr. Takeshi Yoro, famed Japanese philosopher, insect collector, and Professor Emeritus at Tokyo University. Oreck takes us sight-seeing for dragonflies at Kegon falls, cicada-hunting in Osaka, and into the depths of an insect expo in Saitama (where some of the specimens shown sell for hundreds or thousands of US dollars), while narrator Haruku Shinozaki offers us pieces of history, from a primer on mono no aware to the story of an emperor and a dragonfly. Meanwhile fragments of every day Tokyo are juxtaposed with the natural world beyond – subway trains with caterpillars, skyscrapers with forests of bamboo, and so on. The results are uniquely absorbing and immersive, with the facts of the case being less important than the sum experience of the thing. Beetle Queen Conquers Tokyo is about collectors, kids, and philosophers and the love for bugs they all have in common, an expression of a cultural identity at once unfamiliar and accessible, and more broadly a strong argument for finding wonder in the things we so often ignore. It’s a fascinating document of human existence, and patently unforgettable. Factory 25′s region free release of Beetle Queen Conquers Tokyo isn’t the strongest we’ve seen, but the trappings and content add up to make it a desirable package all the same. The packaging itself is quite elegant, and preferable in my opinion to the generic DVD cases that dominate the market. The disc comes housed in an earthy cardboard digi-pack with a small (roughly 4.5″ by 6″) booklet of still photographs, a map of shooting locations, and insightful comments from writer and director Jessica Oreck. The digi-pack is accompanied by a decorative slipcase, whose simple design (hooray for someone who understands the use of white space) really appeals to me. Regardless of the content, this is a package that will look very good on the shelf. The presentation of the documentary is, unfortunately, more problematic. Beetle Queen Conquers Tokyo was digitally photographed, though whether in standard definition or high definition is unknown to me. The transfer here is enhanced at the original aspect ratio of 1.78:1, but is interlaced as opposed to progressive. Fine details (the text of credits, powerlines, edges) often appear quite jagged and ill-defined, undermining any number of gorgeous photographic subjects. It’s not enough to keep me from appreciating the film, but it is distracting. Colors are strong when given the opportunity (the digital photography is often quite stark) and the single layer encode appears more than proficient for the 90 minute feature. The Dolby Digital 2.0 audio supports the original mix just fine, and the film (mostly in Japanese) is accompanied by optional English subtitles. On-disc supplements are light, but I can’t say that I was expecting too much to begin with for this independent documentary. The disc offers a trio of deleted interview snippets with philosopher / professor / beetle aficionado Dr. Takeshi Yoro, roughly five minutes worth in all, and that’s it. The disc menu loaded immediately after I started it up on my set-top player, and that viewers aren’t subjected to an endless parade of adverts or company logos is appreciated.